I saw the writer of Twighlight on Oprah and sat with my mouth hanging wide open. You know The Twighlight Saga right? I think I’m the only person in the world who hasn’t read the first book. Everyone I know, young and old, has gotten sucked into the world of vampires in love. 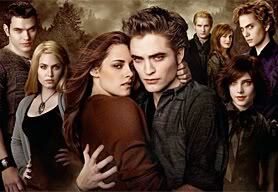 We are now on our second Twighlight movie-New Moon which launches in late November. I had no desire to read these books before. My reading time is precious so I reserve it for things that really interest me. Vampires in love do not-even if they are beautiful to look at in US magazine. Now that I have seen Stephenie (no I didn’t just spell that wrong-her dad did) Meyer tell her story, I’m dying to get my hands on at least one pre-teen novel in this saga. She was a mom of three who had a dream. Her dream was not about publishing a book. No, it was about vampires (chapter 13 of the first book to be exact) which was way out of character for her. She wrote it down-the dream. Then she continued to write the details of the story as they came to her. Stephenie Miller said she was an avid reader but not a writer. She thought it was inherently presumptious to assume anyone would want to read what she had in her own head. I get that. Yet, she kept writing because, as she told Oprah, it was a reconnection to the woman she was outside of mom. So for two years she wrote-telling no one but her sister-because it was a release for her. When she was finished, she had Twilight. I have these exact thoughts. I started and continue to write this blog because I feel like I have thoughts in my head that I have to get out or they’ll suffocate me. I am under no illusion that anyone wants to read or cares about these thoughts. It is a realease and a reconnection, all at one time. I ge the chance to tell my stories and “talk” to people that are older than seven. For a few minutes every day, I get to be Cristie, not mom or wife or carpooler or school-smock-washer. I get to be just me and writing helps me remember and discover who I am in the context of my life as mother. I expect nothing to come of it. If I can help some other mom feel less alone at 3 am then that is icing on the cake. Like Stephenie Miller, I write because I love it not because I am out to create a best selling novel. Too bad I’m not raising vampires in love. Never read the Twilight series and I don't plan on reading it anytime soon. (Never read Harry Potter either) That being said I love this post. This post is about following your heart and your dreams. If something inside you creatively is bursting to get out or if there is something you must do, do it! I love that message. Cristie I love reading your blog and I'm always disappointed on the days when there isn't a new post. I look forward to reading this blog at the beginning or end of each day. (and I'm not even a mom!!) Personally I think that you could definitely write a very witty and very heartwarming novel of some sort. Whatever you do keep writing because I love reading!